Winter squashes last for months when stored at an even 50°F in a dark place. This could be a cool and dark shelf, cabinet, or drawer in the kitchen, pantry, or closet. They also store well in a warmer section of the root cellar such as on the top shelf. Delicata Squash is a good source of Vitamin E (Alpha Tocopherol), Thiamin, Niacin, Vitamin B6, Folate, Calcium and Magnesium, and a very good source of Vitamin A, Vitamin C, Potassium and Manganese. Although technically all winter squash skin is edible, not all tastes good. 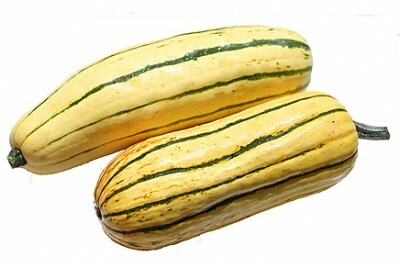 Delicata squash skin is not as tough as some of the other varieties. Don't be afraid to try this one with the skin left on! Savory soups, sweet desserts, and steamy side dishes are some of the tastiest uses for winter squash of all kinds.